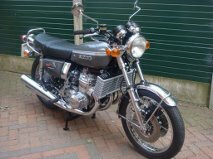 Classic Motorcycle Services have over 30 years experience of restoring and servicing classic Japanese motorcycles along with the more modern type of sports bikes. We specialise in the re-commissioning and restoration of all types of Japanese motorcycles ranging from the 1970’s to current models. Our highly experienced mechanic works to an exceptionally high standard - attention to detail is paramount and comes as standard on all work. We offer all aspects of restoration services for the home restorer and enthusiast alike. We can discuss your requirements and work out a budget to suit you.